WEDNESDAY AT NEC BROCKTON AND JOIN IN AND PLAY! Marvel Monthly OP Tournament: Too Many Spiders!!! CARRY ALL SPECIALTY SERIES FUNKO POPS! ALSO CARRY GUNDMAN MODEL KITS! More variant comics are available, inquire for more information. For more information on these comics, or anything else, call 508-559-5068 or stop in at NEC Brockton. MEGA-STORE! Maxing out at 3200 square feet we are the largest comic shop in southeastern Massachusetts. Providing for a comfortable & enjoyable shopping environment, inside a store bursting with the absolute best of today's comics and pop culture related merchandise. Here is what you can expect when you visit NEC Brockton. COMIC CENTER OF THE UNIVERSE: NEC Brockton is a full line retailer of all the hottest and most popular comics from Avaatar,DC, Marvel, Image, IDW, Dark Horse, Dynamite, Boom Studios, Viz Media and every other publisher from across the comic industry. Including being fully stocked on all DC AND MARVEL TITLES! Whether it's Small Press, or from one of the BIG TWO, we've got it. TOYS-R-US OF NEC: With our mammouth amount of space NEC Brockton is always packed with the coolest collectible toys. We always carry the latest action figures from DC Direct and Diamond Select Plus we have Star Wars, Marvel Legends, Dragon Ball Z, Godzilla action figures at the ready in the store. We are also the place to go to acquire the latest high end Action Figures and super detail statues from Sideshow Toys, Kotobukiya, ARTFX, and if we don't have it we can order it. We are also one of the few local shops that carry Gundam Model kits and Ban Dai DRAGON BALL Z FIGURES! Just in...all new HARLEY QUINN JAE LEE MINI-STATUE! POSTER CENTRAL: We carry dozens of the best posters around. Everything from cool DC posters, such as Batman and Harley Quinn, to the latest Marvel posters featuring your favorite Marvel characters like Flash, Suicide Squad, Thanos, Deadpool, Wolverine, Spider-Man, or the Avengers. Not to mention a host of other posters showcasing everything from Spider-Man, Star Wars, Legend of Zelda, and Hulk. If you need a poster come see us...we are poster heaven! TRADES, TRADES, TRADES! : The best selection in the southcoast area for Trade Paperbacks and Graphic Novels. Featuring full availibity on Batman, Spider-Man, X-Men, Saga, Naruto, Bleach, Sin City, Star Wars, Civil War, Walking Dead, Saga, Hellblazer, Flash, Wolverine, Green Lantern, Justice League, Venom, X-23, Hulk, Preacher, Avengers, Rick and Morty, Punisher, Daredevil, Uncanny X-Men, Attack on Titan, One Piece, Jessica Jones with thousands more to choose from. And our trades are always ON SALE from 10-15% off! KIDS COMICS GALORE! We have a vast array of comics just for kids! Everything from Adventure Time, Sonic, Scooby-Doo, Batman & Superman Young Reader comics, The Simpsons, SpongeBob Squarepants, Teen Titans Go!, Frozen,Figment, TMNT, Bone, Amulet, Jem and Holograms, Minecraft, Guardians of Galaxy, Mickey Mouse, Donald Duck and many others. Plus 'Learn To Read' comics designed for kids who are just beginning to read. SUPPPPPPLIES!!!! : Full line of comic collecting supplies. Comic bags, boards, boxes, archival plastic sleeves, plastic title dividers, and card supplies for storing Magic, Pokemon, Yu-Gi-Oh, and any other card game on the planet. Now carrying Treasury bags and Top Loaders for Prints. Only store in the area offering FULL SIZE and HALF SIZE COMIC DRAW BOXES! INCLUDING NEW ART HALF BOXES FEATURING MARVEL AVENGERS, DC BATMAN, WALKING DEAD, MARVEL HULK. And we now carry BCW Plastic Stackable Half size comic boxes. DID SOMEONE SAY GAMES? 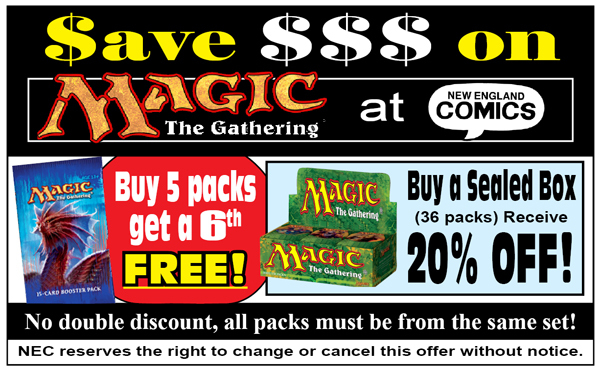 : Never to be outdone, NEC BROCKTON always carries the latest in Pokemon, Yu-Gi-Oh, Magic The Gathering, and the ever popular Heroclix game (Heroclix played every Saturday afternoon) and now playing MAGIC THE GATHERING ON WEDNESDAY NIGHTS & FRIDAY NIGHT MAGIC as well. With special deals for large purchases. And we now carry Star Wars Destiny, Star Wars Imperial Assault, Zombicide....and many other games out there in the marketplace. We also now carry the DRAGONBALL Z CARD GAME, hosting regular tournaments in store. We are the best store in the area for the DBZ game. STYLIN' & PROFILIN': You will find only the coolest T-shirts at NEC Brockton. We carry it all from the most eye catching of Marvel & DC Shirts, to the latest trends, such as Walking Dead, Star Wars, and If you need a shirt come see us, we'll fit you right. GOOD - N- CHEAP: With the huge amount of floor space NEC Brockton wields a mammouth array of over 50+ long boxes of $1.00 comics. Mixing and matching from across the decades you never know what you wil find in them, and how much you can expand your reading dollar by digging through these cardboard gold mines. LAND OF THE RISING SUN: We are one of the few local retailers that stock Manga! Attack on Titan, Black Butler, DragonBall Z, One Piece, Tokyo Ghoul, Zelda, Naurto, Bleach, Avataar, are just a few of the Manga we carry on two well stocked Manga racks. Gift Certificates: Not sure what to get for that special someone? Well we provide Gift Certificates year round to help satisfy your gift giving needs. And the best part? A NEC gift certificate has no time limit on it. It can be used...whenever you like! Perfect for gift giving or a holiday treat. IT'S A 3-D WORLD! : We are the best place to find that unique statue and bust for the serious collector. We carry only the best from DC Direct, SideShow Collectibles, Kotobukia, ARTFX, MEZCO, and Gentle Giant. We have dozens of items in stock now. SPECIAL OFFER...SELECT STATUES ON CLEARANCE NOW FOR 40% OFF! TY BEANIES! : Yes we carry a full array of the always popular Ty Beanie Babies, Baby Boos, and Beanie Balls. They are cute and great items to give out as gifts. New NEC Brockton has something for just about everyone! Stop in shop and witness the comic grandness that is NEC Brockton. We think you're going to love it. New England Comics Brockton your comic retailer for the 21st century! -Take MA-140 N toward TAUNTON/BOSTON. -Merge onto MA-24 N via EXIT 12N toward BOSTON. -Take the RT-123 E exit- EXIT 17A- toward BROCKTON. -Stay STRAIGHT to go onto BELMONT ST/MA-123 N. Continue to follow MA-123 N.
-Turn RIGHT onto CRESCENT ST/MA-123. Continue to follow CRESCENT ST.
-Take MA-62/LOWELL RD. Continue to follow MA-62. -Merge onto I-93 S via the ramp on the LEFT toward BOSTON. -Merge onto MA-24 S via EXIT 4 on the LEFT toward BROCKTON. -Merge onto MA-27 S via EXIT 18A toward BROCKTON. -Turn RIGHT onto MONTELLO ST/MA-27/MA-28. -Turn LEFT onto CRESCENT ST/MA-27 E.
-Turn SLIGHT RIGHT onto PROVIDENCE ST/MA-122A. Continue to follow MA-122A. -Take the RT-146 S ramp toward I-90/MILLBURY/MASS PIKE/PROVIDENCE RI. -Turn SLIGHT RIGHT onto MA-146 S/MA-122A S.
-Merge onto US-20/SOUTHWEST CUTOFF toward US-20/BOSTON/I-90/SPRINGFIELD/MASS PIKE. -Merge onto I-90 E/MASS PIKE/MASSACHUSETTS TURNPIKE via the ramp on the LEFT toward BOSTON (Portions toll). -Merge onto I-95 S/MA-128 S via EXIT 14 toward SOUTH SHORE/CAPE COD. -Merge onto I-93 N/US-1 N via EXIT 12 on the LEFT toward BRAINTREE/BOSTON. -Merge onto MA-24 S via EXIT 4 toward BROCKTON/FALL RIVER.